In the next five minutes I’m going to show you how you can “tweak” your song writing process, so you’ll produce more songs, easier, and of a much higher quality. Do you sometimes feel your songwriting process is a mess? By this I mean, do you feel as if there is no structure… and you’re always jumping from one thing to another. And because of this, you let ideas get away from you. You may have a moment of inspiration, but it doesn’t always translate into a completed masterpiece. Also, you don’t complete nearly as many songs as you feel you should. You’ve always got “half finished” material that ends up being forgotten. If this is true for you (And believe me, most songwriters feel this frustration), why do you think this happens? It’s a good question to ask, because if you can get to the bottom of this issue… if you can learn to streamline your song writing process… you’ll end up writing many more songs in this lifetime, and at the end of your life you’ll be able to look back at these songs and say, “I didn’t live my life with my music stuck in my head”! So let’s stop the mass of “unfinished material” and put some systems into place that will allow you to output excellent song after song. I want to give you a simple technique that will help you do this. Strangely enough, it’s a very simple idea… but it’s helped me greatly to keep on track and write a lot of great songs, very quickly. What you need to do is take out a piece of paper and write out a flowchart of your song writing process. This basically means creating a visual diagram of the different steps you go through when you write a song. 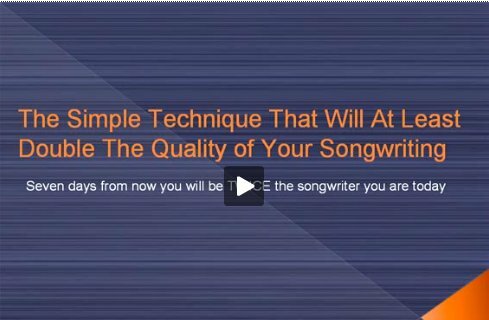 Here’s what this will do for you: It will allow you to develop an incredibly streamlined approach to your song writing. A step-by-step system you can follow when writing a song. And if you follow it you will never get sidetracked, or off focus. NOTE: Now of course, as song writing is a creative process, there are times when you’ll be hit with a profound idea - or maybe a thick stream of ideas. If this happens, it’s strongly recommended to follow these ideas when they come up. But for the most part, you can stick to your “flow charted” song writing process, and it will “cut out” the time wasting distractions that keep you from completing songs. Now the best way to create your flowchart is to look at what you’ve done in the past when you created an entire song in a smooth, streamlined manner. If you can think back to an occasion like this, and then re-create this process on paper, you can use this to streamline your songwriting process from here on in. This is just one flowchart that you could use. How yours looks will depend on the way you write songs, and your song writing strengths. If you EVER leave songs unfinished, you should DEFINITELY create a chart such as this one. Then hang it up in your song writing space, so you can see it at all times. And of course FOLLOW IT! You’ll find song writing much easier, and you will create many more songs because of it. Another important point is this: As time goes by, you need to tweak your flowchart. For example, you may write out a flowchart after finishing this article, but when you begin writing a song, realize you’ve missed some important steps! Also, you’ll often find there are subtle little tweaks you can make to REALLY streamline the process and make each step flow into the next. The point is, you should try and continually improve your process, making it more and more efficient. Over time this will dramatically increase your ability to output songs of a high quality. So be sure to DO this! The benefits you will get from this simple five minute task are massive. I’d like to finish now with a few tips you can use to write out a great flowchart that will get you the most results. It’s vitally important that in your song writing process you keep the CREATIVE tasks and CRITICAL/ORGANIZATIONAL tasks separate. There are some very interesting psychological reasons for this. To give you a brief overview, when you COMBINE these different tasks you will block much of your creative potential, therefore sucking a lot of the power out of your song writing process. So when you write out your flowchart, be sure to assign separate steps for the creative tasks and the critical/organizational tasks. The state of your location, as well as the location itself. The point here is, when you do something incredibly well, it’s no fluke. You are doing something in a very specific way that is bringing about the great result. And if you can discover exactly what you’re doing, and reproduce this, you’ll continue to get these exceptional results. So pay attention to your successes, and when you figure out what makes them “tick”, include this into your flowchart! Finally, if you want to really optimize your song writing process and tap into the deep potential that lies within you, be sure to check out this song writing course. In it you will find many concepts, techniques, and exercises that will allow you to release your full potential as a songwriter. By the time you’re done with the course you will have written many amazing masterpieces that will bring you contentment and large success as a musician.